In August 2004, the precursor to Svartsot was founded in Randers, Denmark, playing folk-influenced black metal. The band went under various names, finally settling on Skoll (the name of the wolf in Nordic myth who pursued the sun, before finally swallowing it). The word “svartsot”, meaning “black sickness” in older Danish, was introduced to the band in late 2004, and was considered as a possible theme for a lyric. At that time no one in the band knew exactly which disease the word referred to, but after some research it was found to be an obsolete name for a liver disorder similar to jaundice. At some time in very early 2005, the band began discussing changing the name to Svartsot as people were confusing Skoll with the English word “skull”. Already in 2004 the music was beginning to digress towards melodic death metal and power metal rather than black metal, and in early 2005 personal differences started showing amongst some members of the band. This culminated in early February, when the vocalist was asked to leave the band. 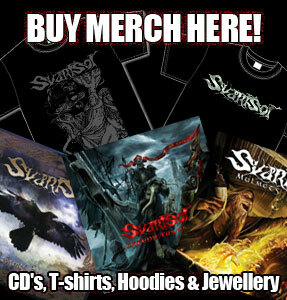 On February 17th 2005 Svartsot was officially formed at a meeting in the band’s rehearsal room. Claus Gnudtzmann, a mutual friend of the other band members, had been asked to join on vocals – a duty he had never before undertaken. Some of the ideas discussed at that meeting are still considered to be Svartsot’s founding principles. The most important of these being the mix of melodic metal and folk music as a backdrop for a lyrical universe based primarily on Danish history and folklore. In addition, the decision to use the Danish language for the lyrics, as opposed to English, was made at this meeting. Finally the growled vocals were introduced at this time, as this was fledgling-vocalist Gnudtzmann’s preferred style. Several songs from the Skoll days were brought into line with the new band philosophy and new songs were written. After a short while the line-up was completed by earlier Skoll drummer Marcelo Freitas, who once again relocated to Denmark from his native Madeira. This short-lived line-up performed Svartsot’s debut concert at Copenhagen’s The Rock in May 2005. After that first concert the visual and musical ideas were appraised, resulting in the adoption of stage-wear and the hiring of Cris J.S. Frederiksen’s friend and whistler/bodhran player Stewart Lewis. Shortly after this, Freitas exited the band due to career responsibilities, and Svartsot worked on new material until new drummer, Niels Thøgersen, joined the band in August 2005. The coalition worked well, and shows were played already in September and October 2005, whilst the first demo, Svundne Tider, was recorded in November of the same year. Much of 2006 was spent writing material and making connections throughout Denmark and abroad. There were a few highlights that year: winning the 2006 edition of the Danish Metal Grand Prix; recording the second demo, Tvende Ravne, at Jacob Bredahl’s Smart ’N’ Hard studio in Århus, Denmark; the track Jotunheimsfærden from the first demo being played on a BBC radio folk music show in the UK, and the same track featuring on the UK’s Terrorizer magazine’s cover-mount CD. Svartsot also had the opportunity to play live, supporting Volbeat in April and as support on a handful of Illdisposed’s Danish shows in September and October 2006. The line-up, which had been stable for around one and a half years, played one final show together, alongside Mercenary at a one-day metal fest in Randers in January 2007, before bassist Henrik Christensen and the rest of the band decided to go separate ways in early February. A couple months and a handful of auditions went by before a replacement bassist was found in Martin Kielland-Brand, an ex-band mate of Thøgersen’s. Shortly after he joined Svartsot, a contract with Austrian label Napalm Records was inked. The debut album, Ravnenes Saga, was recorded and mixed by Jacob Hansen at Hansen Studios in Ribe, Denmark, in July 2007, mastered by Peter In de Betou of Tailor Maid in Stockholm, Sweden, in August 2007 and featured cover art by Finnish cover artist Jan ‘Örkki’ Yrlund. The album was released in early November 2007 and received a host of good reviews. Svartsot’s first ever concert outside of Denmark was played on December 1st 2007 at the Winter Masters of Rock festival in Zlín, Czech Republic. This concert marked the start of an active year for Svartsot, playing a wealth of concerts and festivals both in Denmark and abroad, and touring alongside Týr, Hollenthon, Alestorm and Gwydion on the Ragnarök’s Aaskereia tour in October 2008. The final show of the year was an appearance at the 2008 Danish Metal Awards in November. The band appeared to be going from strength to strength, but appearances are often deceptive. Due to various stress factors, cracks were already showing internally in the band in the early summer of 2008. Attempts were made at remedying the situation on various occasions, but the problems grew as they re-arose time after time. An added aspect was Lewis’ standing out on the October tour due to family responsibilities. A stand-in, Hans-Jørgen Martinus Hansen, was found at the last minute but soon after the DMeA show Lewis announced that he would be taking a break from the band for an indefinite period. That seemed to be the turning point as when heavy discussions once again came about a solution was no longer forthcoming. Within two or three weeks of Lewis’ announcement, Gnudtzmann, Thøgersen, Kielland-Brand and Andersen had left Svartsot. The official reason offered from the departed members was differences in opinion on how the band should be run and the future musical direction of Svartsot. But a great many irreconcilable personal differences were also to blame. For a few days the future of Svartsot hung by a fine thread. Frederiksen was determined to continue in one way or another and after seeking counsel on the issue from Napalm Records, the decision was made to continue under the same moniker and to build a new line-up without too much delay. The next obstacle to be crossed was accessing the Svartsot domain, e-mail account and various profiles, the codes of which had been changed by the departed members. After hefty discussions mediated by Napalm Records, the most important of the codes and the homepage domain were finally signed over to the band, and the seemingly mammoth task of finding new members could begin. Months of announcements and auditions were expected, but progress was much quicker. The split had caused ripples on both the Danish and international metal scenes. Frederiksen was contacted by people from as far away as not only the UK, but even Spain, Russia and the United States. Due to practical reasons it was most desirable to find new members residing in Denmark. Although false and exaggerated rumours on the nature of the split circulated the Danish metal scene, a handful of aspirants still contacted Frederiksen within the first few weeks. Of these an even smaller handful was selected for auditioning, and Cliff Nemanim joined on rhythm guitars, James Atkin on bass and Danni Lyse Jelsgaard on drums. At this point Martinus Hansen confirmed that he would take a permanent place in Svartsot. One or two vocalists were also auditioned, but none of them seemed to fit the band until Thor Bager was discovered quite by chance and invited to an audition. He fell into place right from the start, and the new Svartsot line-up was completed in mid-February 2009. Svartsot took to the Danish stage at the start of March 2009, and performed four concerts in Denmark and one in Poland over the next eight months. Work on material for a new album had been well under way in 2008, but much of this material had now been permanently discarded, as some of the departed members had contributed. With a new line-up, work on material could be resumed. Roughly enough tracks for half an album were already completed, and Frederiksen wrote another batch of tracks over the next few months. New bassist Atkin undertook writing lyrics in his native English for many of the new tracks. These lyrics were subsequently translated to Danish. 13 new tracks in all were soon completed as well as an arrangement of a traditional Danish folk song. By mid-October 2009 Svartsot was once again in the studio, this time at Lasse Lammert’s LSD Tonstudio in Lübeck, Germany. Lasse undertook producing, recording, mixing and mastering duties over the next few months. The album was named Mulmets Viser, and Hungarian artist Gyula Havancsák was given the artwork and layout duties. The album was released through Napalm Records in late March/early April 2010. Although firmly rooted in the Svartsot tradition, the new tracks showed a new maturity and complexity, even if song structures were kept traditionally simplistic. Previously the whistle melodies had generally followed the guitars, but on Mulmets Viser they were predominantly given harmonies or counter melodies to complement the guitar riffs. Mandolins had been used to a limited degree on all earlier recordings, but were now given a larger role, and accordions were also introduced on the album – something that wouldn’t be repeated for the follow-up album. Choral chanting was used on a couple of tracks: something Svartsot had never done before; and more weight was also laid on acoustic guitars: four different acoustic guitars and even an acoustic bass were used on Mulmets Viser, as opposed to just one acoustic guitar on Ravnenes Saga. The rhythm guitars too were given a notch more intensity by dropping the tuning even lower than previously. In general the melodies were more complicated than before and the riff work more earthy. A different sound was also required for this album. Ravnenes Saga had been given a very good, but typical Jacob Hansen sound, which didn’t really fit the music. This time a more organic, yet rawer sound was aimed for, thereby giving both the metal and the folk sides of the music more room to breathe and hopefully allowing the music to grow with each listen. Highlights in 2010 included a guest appearance on two of the Paganfest 2010 extended shows, a position as penultimate band on part of Negura Bunget’s “Spirit of the Land” tour, a requested performance at Napalm Records’ label night and 15th anniversary show at Metalfest Austria, and an unbelievable performance at Wacken 2010. No-one could have prepared us for how awesome that show was going to be! During spring and summer of 2010 work began in earnest for the follow-up to Mulmets Viser. At first the music for a few tracks was written so that we could get a feel for the new material and see which direction, both musically and lyrically, it would be taken. We decided to take on board some of the criticisms levelled at Mulmets (too long, too simple, folk metal by-the-numbers) and really make it as different as possible to what a lot of other folk metal bands were doing. A lot of folk-influenced metal bands, particularly from Scandinavia, sing about the Vikings and Norse mythology. This is often a label attached to the music of Svartsot, and this ‘cliché’ was something we wanted to distance ourselves from. The Svartsot song-writing ethic has always been to explore and portray the rich cultural history of Denmark, which, while including the Vikings, is a far, far broader topic. Only a few of our songs had previously been Viking related, and only a couple have actually been about an aspect of Norse mythology. As the music Cris was writing became darker, more complex and more medieval inspired, we elected to take the lyrics, and Svartsot, firmly into the medieval age. In looking for an album theme, we decided upon the outbreak of the Black Death in Denmark in 1349. This fit the grimmer, more medieval sound perfectly, as well as being appropriately brutal subject matter. (The Black Death killed a lot more people than the Vikings ever did!) As writing progressed, the song writing partnership of Frederiksen and Atkin really began to come together, with far greater complexity becoming evident in both the music and the lyrical aspect. The accordion, which made a brief appearance on Mulmets, was dropped completely, the mandolin parts expanded in prominence and complexity, and a Swedish bagpipe was also added, which really gave the songs a more medieval flavour. The guitar parts expanded to include up to five guitars on some songs, and a combination of mandolin and flutes together, which were used to further support and complement the guitar melodies. After getting down to some serious rehearsal toward the end of 2010/start of 2011, and relieving an increasingly unreliable Cliff Nemanim from guitar duties, we were ready to re-enter Lasse Lammert’s LSD studio (and a number of the pubs thereabouts) in March 2011. Uffe Dons Petersen came in toward the end of the rehearsal period as our replacement guitarist after having played support at a Svartsot show with his previous band and engaging in a lengthy conversation with James about spiky guitars and large beards. Although Uffe did not record any guitars on the album, he did turn out to have the perfect singing voice for Svartsot’s (to date) first and only accoustic song – credit for which usually goes to Thor, despite this not being the case! The highlights of our tour included two shows in St Petersburg and Moscow with Korpiklaani as part of Oktobierfest. While it is amazing to have fans in any part of the world – and you constantly impress us with your dedication and lunacy – the show in Moscow was one of the most amazing gigs we have ever had the pleasure to perform. We have never felt so ‘famous’ as we did that day. We also had an amazing time as part of the Metal Invasion V festival in southern Germany, and at a show in Grenå in Jutland, the small, yet highly enthusiastic audience – counting fans, who had travelled from as far as Sweden and Germany to see the show – managed to smash a large hole through the floor of the venue! At the very last show of the tour, on the very last song of the evening, Uffe managed to (albeit accidentally) smash his beautiful 7-string guitar in twain after a combination of drunken dancing, cables and spilled beer from our earlier stage invasion of Sylvatica, proved to be a dangerous combination. Little did we realise at the time, this proved to be somewhat prophetic. At the beginning of 2012, much to our disappointment, Uffe decided to leave the band to concentrate on his education and his newly expanding family. We were sorry to have to part company with him. On top of everything else, where could we possibly find another guitarist with a beard of such magnitude? Apparently in Århus. Following the recent break-up of his previous band, Michael Alm found himself burdened with no band, and a massive beard! We had met him on a few previous occasions and, before even asking him, were united in the knowledge that he was the right man for the job, and so he turned out to be, playing his first show with the band in February in his home town of Sønderborg in southern Jutland. 2012 has seen us play fewer shows than 2011. One of these performances was opening the 2012 Copenhell Festival to a fortunate few. After this show, our immensely talented drummer, Danni Lyse Jelsgaard, decided to leave the band and pursue his drumming career independently. Fortunately we had a short break of 5 weeks before any further shows in which we could try to find a replacement. Within days we’d found one, however! Step into the breach then, 19 year-old Frederik Uglebjerg. Despite playing for ten years, he had never played … well … a proper gig, so it seemed fitting his first show with the band was closing Boarstream Metal Open Air in southern Germany after only one full rehearsal! Many miles and beers later he has proved an excellent addition to the fold. We have been spending much of our time this year, writing the material for our 4th album. Though by no means complete, the song writing is again increasing in maturity and complexity, while retaining Svartsot’s distinctly tasty melodies. All being well, we should return to the studio some time in 2013 to record it. Until then, we look forward to seeing you on the road, beer in hand! Or if you can’t make it, at least contributing to one of our infamous Facebook discussions!